The story of how the world-changing McDonald’s was bound to become a prestige picture. Jim and Mac McDonald built their store out of nothing and was founded on good ol’ fashioned American ingenuity. Through a lot of failure and a lot of intelligence, these two brothers created a system of efficiency that could feed the world in 30 seconds or less. Which is why The Founder is about the villain of their story. Maybe it’s the byproduct of the U.S. going to hell in a handbasket, but this film is eerily timely. 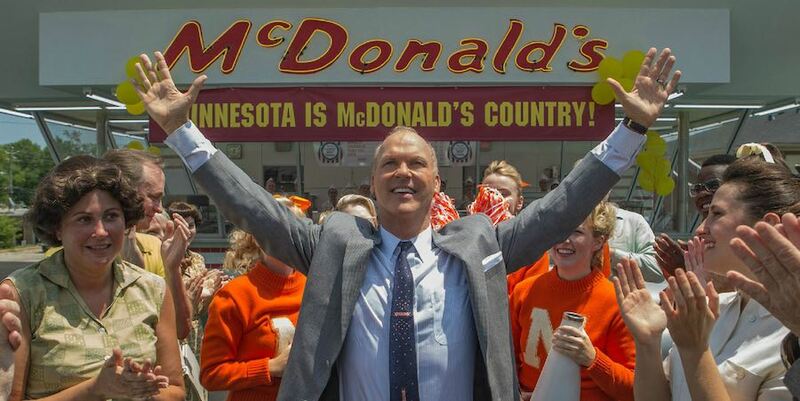 Michael Keaton plays Ray Kroc, a failing milkshake salesman turned fast-food magnate who steals the McDonald’s name and idea for himself. There are certain shadows (though they must be unintentional) of Trump in Kroc’s language, further villainizing our protagonist. But, make no mistake, Kroc is our anti-hero in this film. Director John Lee Hancock isn’t really interested in painting with a heavy brush against Kroc. Instead, everything he does is presented as very matter-of-fact. Kroc’s desire to expand McDonald’s can be construed as a positive, as Jim (Nick Offerman) and Mac (John Carroll Lynch) repeatedly attempt to stand in Kroc’s way. We can’t help but be a bit sympathetic towards Kroc’s plight at the beginning, too. He wants to be at the top of the American dream, but he’s forced to eke out a living as a salesman of expensive chotckeys. He’s forced to feed himself at sparse, low-rent, teenage filled drive-thru’s. When he hears how McDonald’s is thriving, and sees it as a pristine, family-filled burger bar, Kroc latches onto it. The Founder makes no beans of McDonald’s being yet another in a long line of possible failures for Kroc. But the man gets lucky, as he’s coupled his desire with genuine demand for the product he’s shilling. He becomes a juggernaut. As Kroc’s obsession begins to take hold, his personal relationships with the McDonald’s brothers (along with his oh-so-poor wife Ethyl, played by Laura Dern) begin to sour, then turn very antagonistic. Obviously, I’m seeing this film from a very left-leaning perspective, but I am so eager to hear what right-leaning audience members would think about Kroc’s journey. Because Hancock is so even-keel about the insidious nature of stealing an idea, I feel like he presents the takeover as just the end of a business relationship. No malice nor joy; simply a thing that happens. Which makes our anti-hero almost a victor. In the hands of another director , Kroc could have been very insidious. If it wasn’t for the twinge of guilt that Kroc has at the end of the film, his journey would be a victory unscathed. To me, that twinge of guilt felt inauthentic, as he has committed egregious crimes of morality, exploited a marriage to benefit his own ends, and tore down a family. At every turn, he exploited the American Dream to get his way. But, to some, he might just be the guy that took advantage of something and made his American Dream come true. He saw what others couldn’t and changed the world. McDonald’s does feed 1% of the world, as the film purports. And Mac McDonald himself says that he’s not willing to be ruthless to build McDonald’s into an empire. To Ray, lack of ruthlessness is a sin. Why would you settle for a life that is simply satisfactory? Why not be a part of history and be remembered? Leave a real impact on the world instead of just San Bernardino? Why be part of something when you could control it and form it’s truth? This was not the best movie to watch on Inauguration Day. The story of Jim and Mac McDonald itself was a fabulous story truncated to maybe a five minute montage. And their story is a story of good people making good and creating something that helped people. But, like America, The Founder wasn’t the story of two average people making good. It’s about one bad man that found greatness. And that’s the new American Dream. This film was watched at a public screening at the Alamo Drafthouse – South Lamar location in Austin, TX on Friday, January 20 at 4:20 P.M.